During one of James Pearce&apos;s 2016 visits to the Calais Jungle, a refugee member of PC4R recognized him from far away, greeted him warmly, and invited him to share a meal. Musap Yhia was only 10 when he left Darfur. His life had been turned upside-down by the terrible violence that had convulsed what was then Sudan, including a period he doesn’t like to talk about when he survived a kidnapping. From Darfur, he fled to the capital, Khartoum, where he stayed for several years. Finally, in 2013, he decided that the best option was to flee Sudan entirely. After he left, Yhia traveled alone for many months through Egypt and Libya, finally securing a place on a boat across the Mediterranean to Italy. 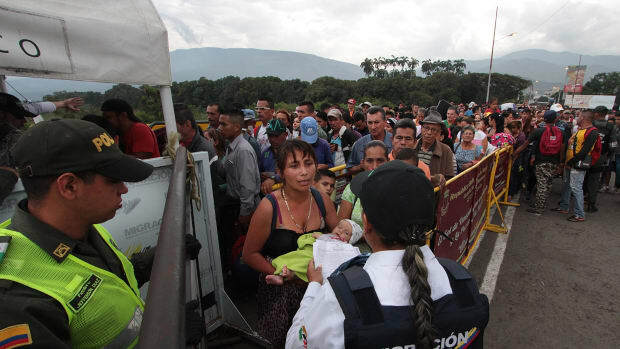 It was a terrible journey; of the 125 people that boarded the boat, only a few survived. 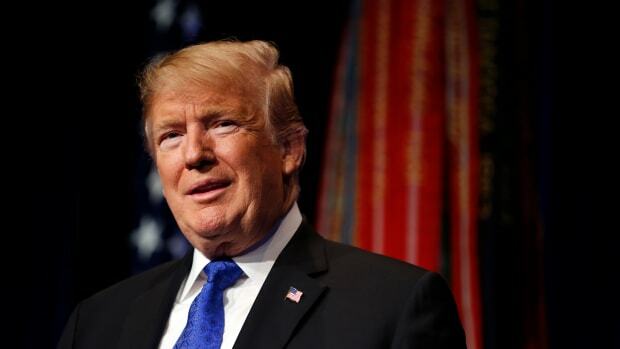 From the shore, he made his way to Calais, France, where he settled in the Jungle, a perhaps-too-polite name for the fetid, chaotic refugee camp that metastasized during the first years of the refugee crisis at the point where travelers leave France for the United Kingdom. Asif Rahimi made a similar decision to leave his native Afghanistan in late 2014. Rahimi, now 28, is Hazara, a predominantly Shiite Muslim ethnic group that has endured enormous persecution from the country&apos;s Sunni majority. Even worse, he is an avowed atheist, which also made him a target for local religious leaders. During his flight, Rahimi made his way first to India, then to the Malaysian coast, and from there by treacherous boat journey to Indonesia. Facing a difficult future, he turned himself in at one of the centers the country had opened for people like him, thinking it would be a source of support. Instead they detained him in a small cell for four years. 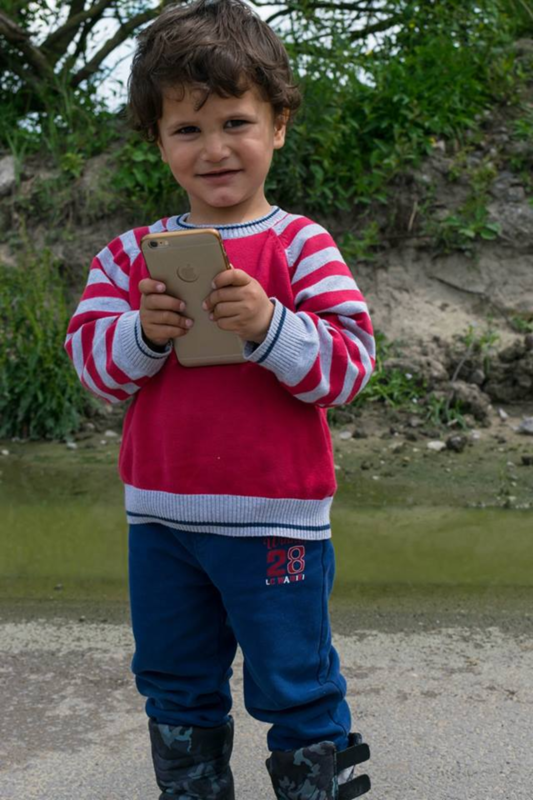 Like many participants in this most recent refugee crises, Rahimi and Yhia both carried mobile phones with them on their journeys as part of their attempts to stay connected with their families and the larger world. But even in the age of affordable SIM cards, data isn&apos;t free. Despite the distance that separated them, they both found the same solution: a Facebook group called Phone Credit for Refugees and Displaced People, sometimes known as PC4R. The group raises funds to add money to the pay-as-you-go mobile accounts frequently used by refugees (or "top up" their mobiles, as the British expression goes). The idea is that supporting free communication helps people with very few resources maintain connections with their homes and even keeps them out of danger; that in the smartphone age, phone credit is something like dignity. Yhia first heard about the group from a charity organization that was providing aid in the Jungle. After receiving his credit, he was able to call his mother in Sudan for the first time in three years. She started crying and couldn&apos;t stop; she had thought he was dead. Rahimi heard about the group from his cell, where he was organizing protests against the detention center for holding refugees who were supposed to go free. Donors from far away giving complete strangers money seemed too outlandish to believe at first, but soon he, too, received credit, and used it to promote his protest efforts over social media. In an era of border walls and rising xenophobia around the globe, the grassroots approach of PC4R encourages individual strangers to give to other individual strangers across the world. That element of direct, personal charity is also part of what has kept the group, started by a British social worker in 2016 with a few of his friends, growing into a behemoth with 60,000 members that tops up more than 1,000 refugees a month. PC4R&apos;s success is an indication of how, beyond sowing discord and building echo chambers, the Internet can also bring people in difficult circumstances and those that seek to help them face-to-pixel-to-face. From Afghanistan to Belgium, Indonesia to England, Lebanon to Sudan, the group provides a kind of connection possible only in an online space where there are no borders, just a sea of strangers with more in common than they expect. 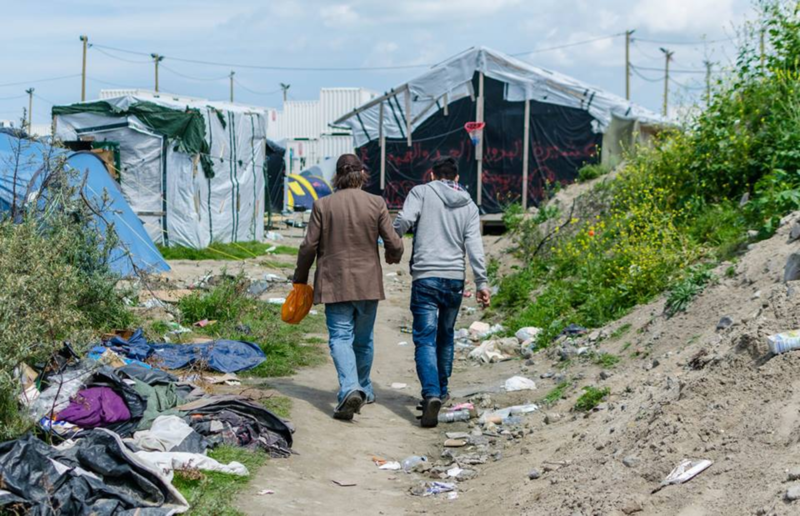 James Pearce first visited Calais in November of 2015 and was shocked at what he found. "The Jungle was a landfill site—rusty metal, human excrement, broken-up asbestos," recalls Pearce, a 34-year-old social worker from Norfolk, an area northeast of London. "One of the volunteers there said that if you had put animals in those conditions, you would have been arrested." Instead of feeling paralyzed by the scale of suffering he saw, Pearce found motivation. “When something is so big and the need is so great, then nothing you do is wasted," he says. "You can start anywhere." Pearce decided to start by working to give the friends he&apos;d made a sense of control over their lives. At first, he thought about a sort of refugees&apos; GoFundMe or online store but concluded that that idea couldn&apos;t work because no one in the Jungle had access to a bank account. Then he thought: What about phone credit? It was something the refugees could have that was theirs to use however they chose. When the mechanism started to work, Pearce asked his refugee friends to add their friends in need to the group. 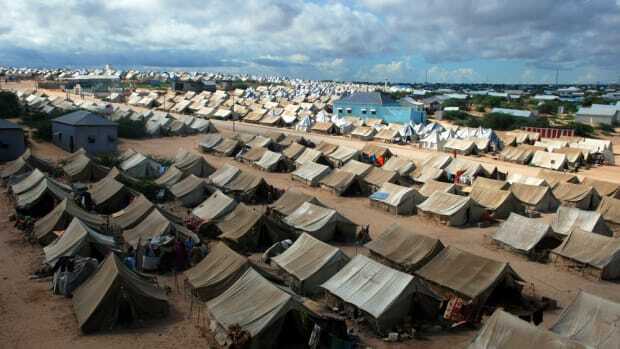 Word spread quickly after that, across networks of camps and tent cities in Europe and Asia. Pearce hasn&apos;t yet topped up any refugees in the Americas, but two Mexican members joined the group recently. He expects more will come. As PC4R has grown, managing it has required more structure. Pearce and a fluctuating team of about 15 administrators have established their organization as a charitable fund in the U.K. and developed extensive protocols on issues ranging from how frequently applicants can receive credit, to when to involve other refugee organizations in situations involving safety concerns, to how to handle legal issues. They&apos;ve also honed a complicated application process to log and confirm the identities of refugee applicants from all over the world, asking for live photos, asylum documents, and phone manufacturing codes. The money itself comes mostly from live fundraising drives, such as the "Friday Conga," where Pearce and other administrators encourage members to comment about their donations live on a single Facebook post, benefiting from the site&apos;s algorithms. "The more people that comment, the more that see it," he says—and the more that donate. Those donations now provide phone credit to some 1,200 refugees per month—almost 50,000 individual top-ups and £825,000 to date—to people requesting from 30 countries worldwide. Pearce and his colleagues have helped kids traveling on the backs of trucks through Europe, giving them access to GPS and helping them navigate unfamiliar highways. They gave credit to a teenager in Italy who used it to look up legal information, contact lawyers, and obtain asylum. Recently, they topped up a woman who was being smuggled across the Mediterranean both before and after her journey, ensuring she could contact authorities if the situation turned dangerous and call her family when she arrived safely. Smartphones provide a crucial lifeline for refugees seeking to stay in touch with loved ones—and to get access to resources from aid organizations. There are challenges inherent to running a grassroots effort that grows up, rather than an organization that is planned at scale. Pearce has had to figure out how to navigate Facebook&apos;s ever-changing systems, how to continue growing the donor side of the group when the stream of refugee requests seems never-ending, and how to resolve questions he never expected to have to answer, the most pressing of them being: How do you pick who should get the limited funds out of the masses of people in difficult circumstances who apply? And how do you make that impossible choice without a lingering guilt that follows you through your days? Pearce says he often spends 40 hours a week on Facebook doing work connected to PC4R, in addition to his full-time job. He acknowledges that the pace is not sustainable, but the cause is so important to so many people that he feels like he can&apos;t quit—plus, he doesn&apos;t want to. "It&apos;s like a train that started slow," he says, "and it would have been a good time to jump off at some point, but now it&apos;s going too fast to stop." Shortly after Rahimi started receiving credit through PC4R, he began volunteering as an administrator, spending nights in his cell "traveling" virtually to interview other top-up applicants far away. "You reach someone in the desert, you reach someone in the sea, you reach someone on the coast," he says. "Other charities can&apos;t do that." A Facebook-based refugee charity can be borderless and international in a way that other charities can&apos;t.
That borderlessness is central to Pearce&apos;s vision for his group. "The fact that it grew from a foundation that was literally person-to-person means it&apos;s a shared space, and that&apos;s something that&apos;s quite powerful," he says. 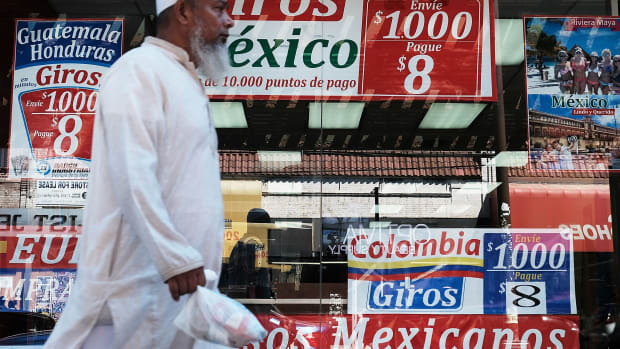 The ratio of refugee members to potential donors hovers around 50:50, and he makes sure there are plenty of opportunities for these two groups to intermingle. Donors announcing their gifts during the Friday Conga are likely to receive at least three or four thank-you notes in varying languages from refugees in Lebanon, Belgium, or the U.K. And Pearce often posts conversation-starters on the Facebook page to prompt dialogue. One of his recent prompts was: "What are your dreams?" In their responses, donors talked mostly of peace; about a world a bit more like the one inside the digital boundaries of PC4R. The refugees tended to envision more specific futures: I&apos;ll become a driver or a security guard or an artist, they wrote, an optometrist or an engineer. 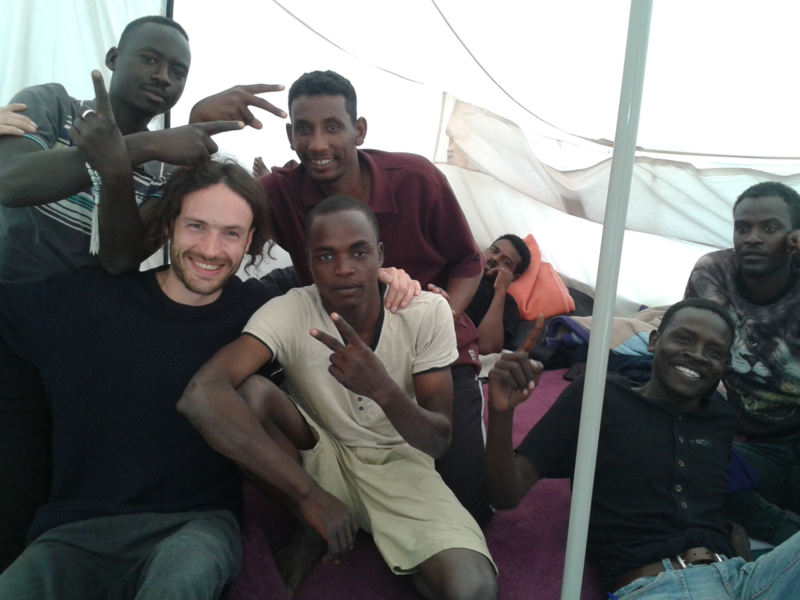 Refugees in the Calais Jungle pose with one of Pearce&apos;s friends during a 2016 visit. These quietly radical exchanges do more than help users pass the time. They also create a space for refugees that reaches beyond their immediate physical needs—thirst, hunger, shelter—in a way many other Western charities fail to achieve. That leaves room to foreground the communities they left behind, the things that make them happy, their preferences and quirks. Suddenly, from an anonymous, far-flung throng emerge individual people in impossibly difficult straits: refugees who like bluegrass or write their own rap, who love eating peanut butter or studying philosophy, who are silly or intellectual or deeply sad, just like anyone else. "I grew up somewhere where there was no one who wasn&apos;t a white, Christian, and atheist, and I thought that refugees would be different from me," Pearce says. "It&apos;s about discovering that it&apos;s not just that we have things in common—but that there&apos;s nothing we don&apos;t have in common." Although Yhia and Rahimi are free and safe now, life remains difficult for them both. Rahimi was released from the detention center into a kind of halfway house with strict curfews and no right to work while he awaits the Indonesian government&apos;s next move. Volunteering with PC4R helps him pass the time; it has also taught him that there are other people out there in his position, just a text message away. "The refugees in Lebanon; in cabins in Turkey; in camps in Greece, Italy, Sudan, or Somalia, I didn&apos;t know anything about them," he says. Working with PC4R makes him feel like he can help someone, somehow, even if he feels helpless himself. Yhia successfully applied for asylum in France and now lives in Nantes, where he is attending high school for the first time at age 25. After graduation, he plans to become a social worker helping refugees like himself. But he also feels terribly isolated: Nantes feels like it exists on a different planet from the one where he grew up. Spending time reading posts from both the PC4R donors and refugee members gives him hope. "We learn we are not alone," he says. "There are people behind us." Not too long ago, Pearce posted a conversation prompt asking donors why they give. The prompt elicited a range of invariably emotional responses: Because I can. Because I care. Because I miss my relatives, but I can call them whenever I want. Because I can&apos;t call my relatives anymore, and wish I could. Because there but for the grace of God go I. "It&apos;s a very direct, personal way to make a real difference to someone stuck in the most intolerable situation," wrote Helen Paynter, a U.K. donor, in her response. A refugee responded to her post in Arabic, writing, "شكرا لك," or, "Thank you very much." His Facebook profile photo showed a boy and girl with dark eyes and a baby in a white cap. "The picture of your children is very beautiful, my friend," Paynter wrote back. Alissa Greenberg is an independent journalist based in Berkeley, California, who covers stories at the intersection of science, business, history, and culture.